All of the Northern Ireland MPs who took part in the House of Commons vote on military action in Syria voted against UK intervention. 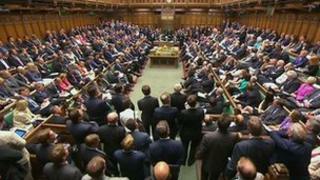 Ten of Northern Ireland's 18 MPs were present for Thursday night's debate, which the government lost by 13 votes. Three DUP MPs, David Simpson, William McCrea and Ian Paisley Jr, were absent. Sinn Féin's five MPs do not take their seats in the Commons, in line with the party's long-standing policy of abstentionism. MPs rejected possible UK military action against Syrian President Bashar al-Assad's government to deter the use of chemical weapons by 285 votes to 272. The prime minister said he would respect the will of the Commons and the government would act accordingly. The DUP's North Belfast MP, Nigel Dodds, said it was "a good day for Parliament which asserted the voice of the people". He told BBC Radio Ulster that people in Northern Ireland had contacted the DUP to say they "didn't want to see military intervention and the UK and its soldiers and its resources being dragged into what it is effectively a nasty sectarian war in Syria". Mr Dodds said: "We made it very, very clear that of course we are appalled by this awful chemical attack in Syria but we have not heard any convincing evidence that a military strike - and it's been said that 'oh this will be a quick surgical military strike' - but there is absolutely no evidence, and the prime minister nor anybody else can give any assurance that's what it would be. "In fact, what it could do would be to lead to large-scale regional destabilisation, with further attacks by other major players like Iran, or whatever. It could make things a lot worse, more people could die." But speaking on the same programme, the Conservative MP Brooks Newmark, said those who voted no to government's motion should "feel ashamed" as it would allow civilians to be slaughtered "with impunity" in Syria. Mr Newmark said he was saddened by the result of the Commons vote which he said had "greatly diminished" the UK's role in the world and marked a "step change" in British foreign policy. "We will no longer be seen as being taken seriously as a military partner in anything in the future now. I think the Americans realise they can no longer rely on us militarily." Mr Newmark added: "On the intelligence level we have a great relationship. I suspect that will continue going forward, but militarily I suspect that they will now look at us and now realise they can't rely on us as a partner going forward." In a statement, the SDLP MP for Foyle, Mark Durkan, said the outcome of the vote was a "significant parliamentary moment reflecting the lessons of previous mistakes". "Last night was not a vote to turn our back on the people of Syria or on the wider world. "It was a vote not to turn a blind eye to the serious consequences of western military intervention in this civil war in the Middle East and the context of all the other problems and dangers there," Mr Durkan added. East Belfast MP Naomi Long said "Parliament had spoken" and the government had "failed to make a case for UK military intervention in Syria". She said the focus "now must intensify on diplomatic pressure and the UN route to resolve the situation". "We all share revulsion at the horrific and sickening scenes that are taking in place in Syria," the Alliance MP said. "The use of chemical weapons against a civilian population is deeply disturbing and must not be allowed to continue; however, our natural impulse to do something in the face of this crisis must not propel us into doing the wrong thing in the wrong way and potentially making things worse, not only in Syria but in the wider region."